Adapted from Walker, 3.2-3.4, pp. 114-128. A much more serious danger to the unity of the church than the Donatist schism which Constantine encountered was the great Arian controversy. It has already been pointed out that while the West, thanks to the work of Tertullian and Novatian, had reached practical unanimity regarding the unity of substance between Christ and the Father, the East was divided. Origen, still its most dominating theological influence, could be quoted in opposing senses. If he had taught the eternal generation of the Son, he had also held Him to be a second God and a creature (ante, 2.9). Adoptionist tendencies persisted, also, about Antioch; while Sabellianism was to be found in Egypt. The East, moreover, was vastly more interested in speculative theology than the West, and therefore more prone to discussion; nor can there be any doubt that, in the fourth century, much more of intellectual ability was to be found in the Greek-speaking than in the Latin-speaking portion of the empire. The real cause of the struggle was these varying interpretations; but the actual controversy began in Alexandria, about 320, in a dispute between Arius and his bishop, Alexander (312 ?-328). Arius, a pupil of Lucian of Antioch, was presbyter in charge of the church known as Baucalis. He was advanced in years and held in high repute as a preacher of learning, ability, and piety. Monarchian influences imbibed in Antioch led him to emphasize the unity and self- contained existence of God. In so far as he was a follower of Origen, he represented the great Alexandrian’s teaching that Christ was a created being. As such He was not of the substance of God, but was made like other creatures from “nothing.” Though the first-born of creatures, and the agent in fashioning the world, He was not eternal. “The Son has a beginning, but . . . God is without beginning.” Christ was, indeed, God in a certain sense to Arius, but a lower God, in no way one with the Father in essence or eternity. In the incarnation, this Logos entered a human body, taking the place of the human reasoning spirit. To Arius’s thinking, Christ was neither fully God nor fully man, but a tertium quid between. This is what makes his view wholly unsatisfactory. Bishop Alexander was influenced by the other side of Origen’s teaching. To him the Son was eternal, like in essence to the Father, and wholly uncreated. His view was, perhaps, not perfectly clear, but its unlikeness to that of Arius is apparent. Controversy arose between Arius and Alexander, apparently on Arius’s initiative. It soon grew bitter, and about 320 or 321 Alexander held a synod in Alexandria by which Arius and a number of his sympathizers were condemned. Arius appealed for help to his fellow pupil of the school of Lucian, the powerful bishop, Eusebius of Nicomedia, and soon found a refuge with him. Alexander wrote widely to fellow bishops, and Arius defended his own position, aided by Eusebius. The Eastern ecclesiastical world was widely agitated. Such was the situation when Constantine’s victory over Licinius (324) made him master of the East as well as of the West. The quarrel threatened the unity of the church which he deemed essential. Constantine therefore sent his chief ecclesiastical adviser, Bishop Hosius of Cordova, in Spain, to Alexandria with an imperial letter, counselling peace and describing the issue involved as “an unprofitable question.” The well- meant, but bungling effort was vain. Constantine, therefore, proceeded to employ the same device he had already made use of at Arles in the Donatist dispute. He called a council of the entire church. That of Arles had been representative of all the portion of the empire then ruled by Constantine. Constantine was now master of all the empire, and therefore bishops of all the empire were summoned. The-principle was the same, but the extent of Constantine’s enlarged jurisdiction made the gathering in Nicaea the First General Council of the church. The council, which assembled in Nicsea in May, 325, has always lived in Christian tradition as the most important in the history of the church. To it the bishops were summoned at government expense, accompanied by lower clergy, who did not, however, have votes in its decisions. The East had the vast preponderance. Of about three hundred bishops present only six were from the West. It included three parties. A small section, led by Eusebius of Nicomedia, were thoroughgoing Arians. Another small group were equally strenuous supporters of Alexander. The large majority, of whom the church historian, Eusebius of Caesarea, was a leader, were not deeply versed in the question at issue. Indeed, the majority, as a whole, were described by an unsympathetic writer as “simpletons.” As far as they had any opinion, they stood on the general basis of the teachings of Origen. Conspicuous in the assembly was the Emperor himself, who, though not baptized, and therefore not technically a full member of the church, was far too eminent a personage not to be welcomed enthusiastically. Almost at the beginning of the council a creed presented by the Arians was rejected. Eusebius of Cæsarea then offered the creed of his own church. It was a sweet-sounding confession, dating from before the controversy, and was, therefore, wholly indefinite as to the particular problems involved. the influences which secured these changes were Western, doubtless above all that of Hosius of Cordova, supported by the Emperor. In particular, the test word, homoousion, had long been orthodox in its Latin equivalent (“consubstantial”), and had been in philosophic usage in the second century, though rejected by a synod in Antioch in the proceedings against Paul of Samosata (ante, §2.8). Indeed, it was used very sparingly by Athanasius himself in his earlier defense of the Nicene faith. It is easy to understand Constantine’s attitude. Essentially a politician, he naturally thought a formula that would find no opposition in the Western half of the empire, and would receive the support of a portion of the East, more acceptable than one which, while having only a part of the East in its favor, would be rejected by the whole West. To Constantine’s influence the adoption of the Nicene definition was due. That he ever understood its shades of meaning is more than doubtful; but he wanted a united expression of the faith of the church on the question in dispute, and believed that he had found it. Under his supervision all but two of the bishops present signed it. These, and Arius, Constantine sent into banishment. The imperial polities had apparently secured the unity of the church, and had given it what it had never before possessed, a statement which might be assumed to be a universally recognized creed. Besides this action in thus formulating the creed, the Council of Nicæa issued a number of important canons regulating church discipline, paved the way for the return of those in Egypt who had joined the Melitian schism over the treatment of the lapsed, made easy the readmission of Novatians, and ordered a uniform date in the observation of Easter. It is not strange, in view of the manner in which the Nicene creed was adopted, that soon after the council ended great opposition to its test word, homoousion, was manifested in the East. To the defeated Arians it was, of course, obnoxious. They were few. To the large middle party of disciples of Origen it was scarcely less satisfactory, for to them it seemed Sabellian. Though Eusebius of Nicomedia and his Arian sympathizer, Theognis of Nicæa, had signed, their evident hostility was such that Constantine sent both bishops into exile. By 328, however, they were home again, possibly through the favor of the Emperor’s sister, Constantia. Eusebius soon acquired a greater influence over Constantine than any other ecclesiastic of the East, and used it to favor the cause of Arius. With such elements of opposition to the Nicene result, the real battle was not in the council but in the more than half a century which followed its conclusion. Meanwhile the great defender of the Nicene faith had come fully on the scene. Athanasius was born in Alexandria about 295. In the early stages of the Arian controversy he was a deacon, and served as private secretary to Bishop Alexander. As such he accompanied his bishop to Nicaea, and on Alexander’s death, in 328, was chosen in turn to the Alexandrian bishopric —a post which he was to hold, in spite of attack and five banishments, till his own demise in 373. [Although not universally regarded] as a great speculative theologian, Athanasius was a great character. In an age when court favor counted for much, he stood like a rock for his convictions, and that the Nicene theology ultimately conquered was primarily due to him, for the Nicene West possessed no able theologian. To him, the question at issue was one of salvation, and that he made men feel it to be so was a main source of his power. The Greek conception of salvation had been, since the beginnings of the tradition of Asia Minor, the transformation of sinful mortality into divine and blessed immortality (theosis/divinization) —the impartation of “life” (ante, §1.7). Only by real Godhead coming into union with full manhood in Christ could the transformation of the human into the divine be accomplished in Him, or be mediated by Him to His disciples. As Athanasius said: “He [Christ] was made human that we might be made divine.” To his thinking the great error of Arianism was that it gave no basis for a real salvation. Well was it for the Nicene party that so moderate, yet determined, a champion stood for it, since the two other prominent defenders of the Nicene faith, Bishops Marcellus of Ancyra and Eustathius of Antioch, were certainly far from theologically impeccable, and were accused, not wholly rightly, of opinions decidedly Sabellian. Eusebius of Nicomedia soon saw in Athanasius the real enemy. Constantine would not desert the Nicene decision, but the same practical result could be achieved, Eusebius thought, by striking its defenders. Political and theological differences were cleverly used to secure the condemnation of Eustathius in 330. The Eusebians determined to secure the discomfiture of Athanasius and the restoration of Arius. The latter, who had returned from banishment even before Eusebius, now presented to Constantine a creed carefully indefinite on the question at issue. To Constantine’s untheological mind this seemed a satisfactory retraction, and an expression of willingness to make his peace. He directed Athanasius to restore Arius to his place in Alexandria. Athanasius refused. Charges of overbearing and disloyal conduct were brought against Athanasius. Constantine was finally persuaded that the main obstacle in the path of peace was Athanasius’s stubbornness. The bishops assembled for the dedication of Constantine’s just completed church in Jerusalem, met in Tyre, and then in Jerusalem, under Eusebian influences, and decided in favor of Arius’s restoration in 335, and near the end of the year Constantine banished Athanasius to Gaul. Shortly after the same forces procured the deposition of Marcellus of Ancyra for heresy. The leading defenders of the Nicene creed being thus struck down, the Eusebians planned the restoration of Arius himself to church fellowship; but on the evening before the formal ceremony should take place Arius suddenly died (336). An aged man, the excitement may well have been fatal. The Nicene faith seemed thus not officially overthrown, but practically undermined, when Constantine died on May 22, 337. Shortly before his demise he was baptized at the hands of Eusebius of Nicomedia. The changes which his life had witnessed, and he had largely wrought, in the status of the church were enormous; but they were not by any means wholly advantageous. If persecution had ceased, and numbers were rapidly growing under imperial favor, doctrinal discussions that earlier would have run their course were now political question of the first magnitude, and the Emperor had assumed a power in ecclesiastical affairs which was ominous for the future of the church. Yet in the existing constitution of the Roman Empire such results were probably inevitable once the Emperor himself should become, like Constantine, an adherent of the Christian faith. The death of Constantine was succeeded by the division of the empire among his three sons, with some intended provisions for other relatives that were frustrated by a palace intrigue and massacre. Constantine II, the eldest, received Britain, Gaul, and Spain; Constantius, Asia Minor, Syria, and Egypt; while the intermediate portion came to the youngest, Constans. Constantine II died in 340, so that the empire was speedily divided between Constans in the West, and Constantius in the East. Both Emperors showed themselves, from the first, more partisan in religious questions than their father had been. A joint edict of 346 ordered temples closed, and forbade sacrifice on pain of death. The law was, however, but slightly enforced. The Donatist controversy in North Africa had greatly extended, and that land, in consequence, was the scene of much agrarian and social agitation. The Donatists were, therefore, attacked in force by Constans, and though not wholly crushed, were largely rooted out. The most important relationship of the sons of Constantine to the religious questions of the age was to the continuing Nicene controversy. Under their rule it extended from a dispute practically involving only the East, as under Constantine, to an empire-wide contest. At the beginning of their joint reigns the Emperors permitted the exiled bishops to return. Athanasius was, therefore, once more in Alexandria before the close of 337. Eusebius was, however, still the most influential party leader in the East, and his authority was but strengthened when he was promoted, in 339, from the bishopric of Nicomedia to that of Constantinople, where he died about 341. Through the influence of Eusebius Athanasius was forcibly driven from Alexandria in the spring of 339, and an Arian bishop, Gregory of Cappadocia, put in his place by military power. Athanasius fled to Rome, where Marcellus of Ancyra soon joined him. East and West were now under different Emperors, and Constans held to the Nicene sympathies of his subjects. Not merely was the empire divided, but Bishop Julius of Rome could now interfere from beyond the reach of Constantius. He welcomed the fugitives and summoned their opponents to a synod in Rome, in 340, though the Eusebians did not appear. The synod declared Athanasius and Marcellus unjustly deposed. The Eastern leaders replied not merely with protests against the Roman action, but with an attempt to do away with the Nicene formula itself, in which they had the support of Constantius. Two synods in Antioch, in 341, adopted creeds, far, indeed, from positively Arian in expression, but from which all that was definitely Nicene was omitted. In some respects they represented a pre-Nicene orthodoxy. The death of Eusebius, now of Constantinople, at this juncture cost the opponents of the Nicene decision his able leadership. The two brother Emperors thought that the bitter quarrel could best be adjusted by a new General Council, and accordingly such a body gathered in Sardica, the modern Sofia, in the autumn of 343. General Council it was not to be. The Eastern bishops, finding themselves outnumbered by those of the West, and seeing Athanasius and Marcellus in company with them, withdrew. By the Westerners Athanasius and Marcellus were once more approved, though the latter was a considerable burden to their cause by reason of his dubious orthodoxy. East and West seemed on the point of ecclesiastical separation. The Council of Sardica had completely failed in its object of healing the quarrel, but the Westerners there assembled passed several canons, under the leadership of Hosius of Cordova, that are of great importance in the development of the judicial authority of the bishop of Rome. What they did was to enact the actual recent course of proceedings regarding Athanasius and Marcellus into a general rule. It was decided that in case a bishop was deposed, as these had been, he might appeal to Bishop Julius of Rome, who could cause the case to be retried by new judges, and no successor should be appointed till the decision of Rome was known. They were purely Western rules and seem to have aroused little attention, even in Rome, at the time, but were important for the future. The two imperial brothers were convinced that the controversy was assuming too serious aspects. At all events, Constans favored Athanasius, and the rival bishop, Gregory, having died, Constantius permitted Athanasius to return to Alexandria in October, 347, where he was most cordially welcomed by the overwhelming majority of the population, which had always heartily supported him. The situation seemed favorable for Athanasius, but political events suddenly made it worse than it had ever been. A rival Emperor arose in the West in the person of Magnentius, and in 350 Constans was murdered. Three years of struggle brought victory over the usurper to Constantius, and left him sole ruler of the empire (353). Constantius, at last in full control, determined to end the controversy. To his thinking Athanasius was the chief enemy. The leadership against Athanasius was now in the hands of Bishops Ursacius of Singidunum, and Valens of Mursa. At synods held in Arles in 353, and in Milan in 355, Constantius forced the Western bishops to abandon Athanasius, and to resume communion with his Eastern opponents. For resistance to these demands Liberius, bishop of Rome, Hilary of Poitiers, the most learned bishop of Gaul, and the aged Hosius of Cordova were sent into banishment. Athanasius, driven from Alexandria by military force in February, 356, began his third exile, finding refuge for the next six years largely among the Egyptian monks. At a synod held in Sirmium, the Emperor’s residence, in 357, ousia (substance) in any of its combinations was forbidden as unscriptural. This, so far as the influence of the synod went, was an abolition of the Nicene formula. Hosius signed it, though he absolutely refused to condemn Athanasius. The declaration of Sirmium was strengthened by an agreement secured by Constantius at the little Thracian town of Nice, in 359, in which it was affirmed “ we call the Son like the Father, as the holy scriptures call Him and teach.” The Emperor and his episcopal favorites, notably Valens of Mursa, now secured its acceptance by synods purporting to represent East and West, held in Rimini, Seleucia, and Constantinople. The Old-Nicene formula was set aside, and the whole church had, theoretically, accepted the new result. The proper term, the only one allowed in court circles, was “the Son is like the Father”—homoios—hence those who supported its use were known as the Homoion (“like”) party. Apparently colorless, the history of its adoption made it a rejection of the Nicene faith, and opened the door to Arian assertions. The Arians had triumphed for the time being, and that success was largely aided by the fact that its Homoion formula appealed to many who were heartily tired of the long controversy. Really, however, the Arian victory had prepared the way for the ruin of Arianism, though that result was not immediately apparent. The opposition to the Nicene formula had always been composed of two elements: a small Arian section, and a much larger conservative body, which stood mainly on positions reached by Origen, to which Arianism was obnoxious, but which looked upon homoousios, the Nicene phrase, as an unwarranted expression already condemned in Antioch, and of Sabellian ill-repute. Both elements had worked together to resist the Nicene formula, but their agreement went no further. Extreme Arians were raising their heads in Alexandria and elsewhere. The conservatives were even more hostile to them than to the Nicene party. They would not say homoousios —of one substance—but they were willing to say homoiousios —not in the sense of like substance, as the natural translation would be, but of equality of attributes. They were also beginning to draw a distinction between ousia—substance, essence—and hypostasis—now using the latter in the sense of “subsistence,” instead of making them equivalent, as in the Nicene symbol. This enabled them to preserve the Origenistic teaching of “three hypostases,” while insisting on the community of attributes. The newly formed middle party came first into evidence with a synod at Ancyra, in 358, and its chief early leaders were Bishops Basil of Ancyra, and George of Laodicea. They have usually been called the Semi- Arians, but the term is a misnomer. They rejected Arianism energetically. They really stood near to Athanasius. He recognized this approach, and Hilary of Poitiers furthered union by urging that the conservatives meant by homoiousios what the Nicene party understood by homoousios. The ultimate Nicene victory was to come about through the fusion of the Nicene and the “Semi-Arian” parties. In that union the tradition of Asia Minor, and the interpretations of Origen were to combine with those of Alexandria. It was a slow process, however, and in its development the earlier Nicene views were to be considerably modified into the New-Nicene theology. Constantius died in 361 as he was preparing to resist his cousin, Julian, whom the soldiers in Paris had declared Emperor. His death left the Roman world to Julian. Spared on account of his youth at the massacre of his father and other relatives on the death of Constantine, he looked upon Constantius as his father’s murderer. Brought up in peril of his life, and forced to strict outward churchly observance, he came to hate everything which Constantius represented, and was filled with admiration for the literature, life, and philosophy of the older Hellenism. He was not an “apostate,” in the sense of a turncoat. Though necessarily concealed from the public, his paganism had long been real, when his campaign against Constantius enabled him publicly to declare it. It was pagan ism of a mystical, philosophical character. On his accession he attempted a pagan revival. Christianity was everywhere discouraged, and Christians removed from office. Bishops banished under Constantius were recalled, that the quarrels of Christians might aid in the pagan reaction. Athanasius was thus once more in Alexandria in 362, but before the year was out was exiled for the fourth time by Julian, who was angered by his success in making converts from paganism. Julian’s reign was soon over. In 363 he lost his life in a campaign against the Persians. In him Rome had its last pagan Emperor. The reign of Julian showed the real weakness of the Arianizing elements which Constantius had supported. Athanasians and Semi-Arians drew together. Furthermore, the Nicene debate was broadening out to include a discussion of the relations of the Holy Spirit to the Godhead. Since the time of Tertullian, in the West, Father, Son, and Holy Spirit had been regarded as three “persons,” of one substance (ante, p. 69). The East had reached no such unanimity. Even Origen had been uncertain whether the Spirit was “created or uncreated,” or “a son of God or not.” There had not been much discussion of the theme. Now that it had come forward, the homoousia of the Holy Spirit with the Father, seemed to Athanasius and his friends a corollary from the homoousia of the Son. At a synod held in Alexandria in 362, by the just returned Athanasius, terms of union were drawn up for rival parties in Antioch. It would be sufficient “to anathematize the Arian heresy and confess the faith confessed by the holy Fathers at Nicaea, and to anathematize also those who say that the Holy Ghost is a creature and separate from the essence of Christ.” The employment of the terms “three hypostases” and “one hypostasis” the synod regarded as indifferent, provided “three” was not used in the sense of “alien in essence,” and “one” in that of Sabellian unity. The door was thus opened by Athanasius himself not only for the full definition of the doctrine of the Trinity, but for the New-Nicene orthodoxy, with its Godhead in one essence (substance) and three hypostases. The death of Julian was succeeded by the brief reign of Jovian. The empire had once more a Christian ruler, and happily, one who interfered little in ecclesiastical politics. Athanasius promptly returned from his fourth exile. Jovian’s rule ended in 364, and he was succeeded by Valentinian I (364- 375), who, finding the imperial defense too great a task, took charge of the West, giving to his brother, Valens (364-378) the sovereignty of the East. Valentian interfered little with churchly affairs. Valens came under the influence of the Arian clergy of Constantinople, and both Homoousian and Homoiousian sympathizers shared his dislike—a situation which helped to bring these parties nearer together. He condemned Athanasius to a fifth and final exile, in 365; but it was brief, and the aged bishop did not have to go far from the city. Valens was, however, no such vigorous supporter of Arianism as Constantius had been. Athanasius died in Alexandria, in 373, full of years and honors. At the death of Athanasius the leadership in the struggle was passing into the hands of new men, of the New-Nicene party. Chief of these were the three great Cappadocians, Basil of Caesarea in Cappadocia, Gregory of Nazianzus, and Gregory of Nyssa. Born of a prominent Cappadocian family about 330, Basil received the best training that Constantinople and Athens could yield, in student association with his life-long friend Gregory of Nazianzus. About 357 he yielded to the ascetic Christian tendencies of the age, and gave up any idea of a career of worldly advancement, living practically as a monk. He visited Egypt, then the home of the rising monastic movement, and became the great propagator of monasti- cism in Asia Minor. He was, however, made for affairs and not for the cloister. Deeply versed in Origen, and in sympathy with the Homoiousian party, he belonged to the section which gradually came into fellowship with Athanasius, and like Athanasius he supported the full consubstantiality of the Holy Spirit. To the wing of the Homoiousian party which refused to regard the Spirit as fully God—the so-called Macedonians— he offered strenuous opposition. It was a far-reaching victory for his cause when Basil became bishop of the Cappadocian Caesarea, in 370. The post gave him ecclesiastical authority over a large section of eastern Asia Minor, which he used to the full till his early death, in 379, to advance the New-Nicene cause. He sought also to promote a good under standing between the opponents of Arianism In the East and the leaders of the West. Gregory of Nyssa was Basil’s younger brother. An orator of ability, and a writer of even greater skill and theological clearness than Basil; he had not Basil’s organizing and administrative gifts. His title was derived from the little Cappa- docian town—Nyssa—of which he became bishop in 371 or 372. He lived till after 394, and ranks among the four great Fathers of the Oriental Church. Athanasius (and Marcellus) taught the one God, leading a threefold personal life, who reveals Himself us such. The Cappadocians think of three divine hypostases, which, as they manifest the same activity, are recognized as possessing one nature and the same dignity. The mystery for the former lay in the trinity; for the latter, in the unity. . . . 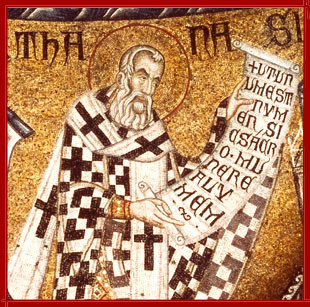 The Cappadocians interpreted the doctrine of Athanasius in accordance with the conceptions and underlying principles of the Logos-Christology of Origen. They paid, however, for their achievement a high price, the magnitude of which they did not realize—the idea of the personal God. Three personalities and an abstract, impersonal essence, are the resultant. The original Nicene success and the temporary triumph of Arianism had been made possible by imperial interference. The same force was to give victory to the New-Nicene orthodoxy. The death of Valens in the great Roman defeat by the West Goths, near Adrianople, in 378, left his nephew, Gratian, the sole surviving ruler. Gratian preferred the care of the West, and wisely appointed as Emperor for the East an able general and administrator, Theodosius, who became ultimately, for a brief period, the last sole ruler of the Roman Empire. Born in Spain, he grew up in full sympathy with the theology of the West, and shared to the utmost its devotion to the Nicene faith. In 380, in conjunction with Gratian, he issued an edict that all should “hold the faith which the holy Apostle Peter gave to the Romans,” which he defined more particularly as that taught by the existing bishops, Damasus of Rome, and Peter of Alexandria. This edict constitutes a reckoning point in imperial politics and ecclesiastical development. Henceforth there was to be but one religion in the empire, and that the Christian. Moreover, only that form of Christianity was to exist which taught one divine essence in three hypostases, or, as the West would express it in supposedly similar terms, one substance in three persons. Yet even when the synod of 381 met, the Nicene creed, as adopted in 325, failed to satisfy the requirements of theological development in the victorious party. It said nothing regarding the consubstantiality of the Holy Spirit, for instance. A creed more fully meeting the state of discussion was desirable, and actually such a creed came into use, and by 451 was regarded as adopted by the General Council of 381. It ultimately took the place of the genuine Nicene creed, and is that known as the “Nicene” to this day. Its exact origin is uncertain, but it is closely related to the baptismal creed of Jerusalem, as reconstructible from the teaching of Cyril, afterward bishop of that city, about 348; and also to that of Epiphanius of Salamis, about 374. On reviewing this long controversy, it may be said that it was a misfortune that a less disputed phrase was not adopted at Nicaea, and doubly a misfortune that imperial interference played so large a part in the ensuing discussions. In the struggle the imperial church came into existence, and a policy of imperial interference was fully developed. Departure from official orthodoxy had become a crime. Theodosius’s attitude was no less strenuous toward remaining pagan ism than in regard to heretical Christian parties. In 392 he forbade pagan worship under penalties similar to those for treason and sacrilege. It was the old weapon of pagan ism against Christianity now used by Christian hands against pagan ism. Constantine’s toleration had fully disappeared. Nevertheless, pagan worship persisted, and only slowly died out. 1Arius to Eusebius, Theodoret, Church History, 1.4; Ayer, p. 302. 1 Letter of Alexander, in Socrates, Church History, 1.6. Letter in Eusebius, Life of Constantine, 2.64-72. Socrates, Church History, 1.26; Ayer, p. 307. Codex Theodosianus, 16:10.4; Ayer, p. 323. Hilary of Poitiers, De Synodis, 11; Ayer, p. 317. De Synodis, 88; Ayer, p. 319. Tomus ad Antiochenos, 3; Ayer, p. 350. Seeberg, Text-Book of the History of Doctrines, Eng. tr., 1:232. Codex Theodosianus, 161; Ayer, p. 367. Ayer, Source Book, pp. 354-356. Codex Theodosianus, 16,10, 12; Ayer, p. 347.
xcxxcxxc F ” This Webpage was created for a formation class at Saint Andrew's Abbey, Valyermo, California in 2000....x.... ’ “”.